Novemberfest is a fun family event that many residents of the Brandon and surrounding communities Novemberfest is taking place on Wednesday - Sunday, November 9 - 13 at Nativity Catholic Church. Corndogs, hamburgers, hotdogs, and cotton candy – are you getting hungry yet? If you are, then you will be glad to know that Novemberfest is right around the corner. Nativity Catholic Church of Brandon will be holding its 42nd annual Novemberfest Wednesday-Sunday November 9 -13. 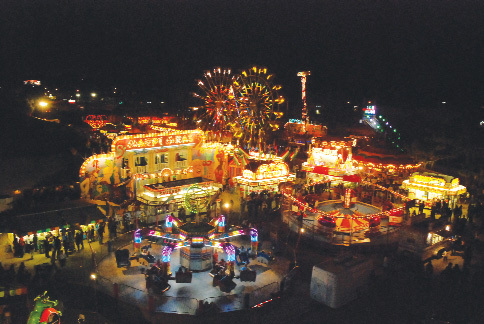 The festival is held on the church’s grounds and is recognized as the third largest social event in Hillsborough County, after the Florida State Fair and the Strawberry Festival, drawing more than 100,000 visitors to the Brandon community. On Friday, November 4, a kick-off dinner hosted by Formaggio’s Italian Restaurant will be held at the church’s social hall from 5-7:30 p.m.
On Saturday, November 5, the 4th Annual 5k Run/One Mile Walk will start and end at the church. Participants can register for the run/walk at 7 a.m. and will receive a runner’s T-shirt and a gift bag. The run/walk begins at 8 a.m.
For more information about the run/walk or to register for the event, visit the school’s website at www.nativitycatholicschool.org. In addition to the run/walk, there will be a Novemberfest Idol singing competition. The competition is in its second year and gives local talent a chance to perform for the community. The first and second place winners will receive a $500 recording session at a local recording studio. Many families in Brandon and the surrounding communities look forward to Novemberfest each year because it offers rides for all ages along with a great food at affordable prices. Single ride tickets are available for $1. Armbands are $22, but if you purchase them in advance by November 5, they are only $16 and are good for unlimited rides for a day. In addition, tickets will be sold for a raffle for a grand prize of $5,000 during the event. “I remember how much fun I had as a child attending Novemberfest and I wanted to contribute to ensure my children; who attend Nativity Catholic School; as well as all of the kids in our community have the same opportunity that I did,” said R.J. Brauneker, chairman of Novermberfest. “It’s a safe environment, its family fun and a good event for the local community to participate in,” he said. To audition for Novemberfest Idol, or for more information on the festival, visit www.nativitycatholicchurch.org. Nativity Catholic Church is located at 705 E. Brandon Blvd. in Brandon.